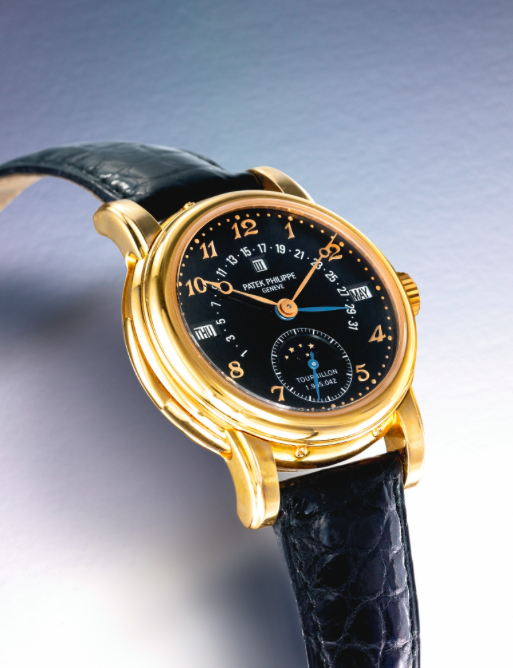 This month, two of the finest auction houses in the world held their “Important Watches” auctions. Sotheby’s kicked off in New York City on June 11th, followed by Christie’s, also in New York City on June 17th. 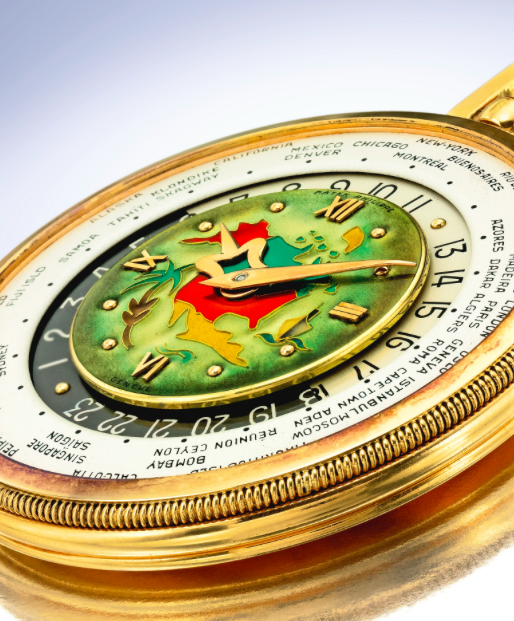 Boasting a final total of $12.5 million and $8.4 million respectively, the auctions featured a large selection of vintage Rolexes, Patek Philippes and other museum-quality timepieces, dating back as early as the 18th century and as recent as this year. In general, both auctions went very well for both houses with some very well with a few pieces achieving big prices. Read on for our favorite pieces from each auction. With a striking black dial, this exquisite Patek Perpetual calendar once held the title of the most complicated Patek Philippe wristwatch ever produced. In excellent condition—at only 20 years old—the watch features a marking of JPH, the signature of renowned case maker Jean-Pierre Hagmann. 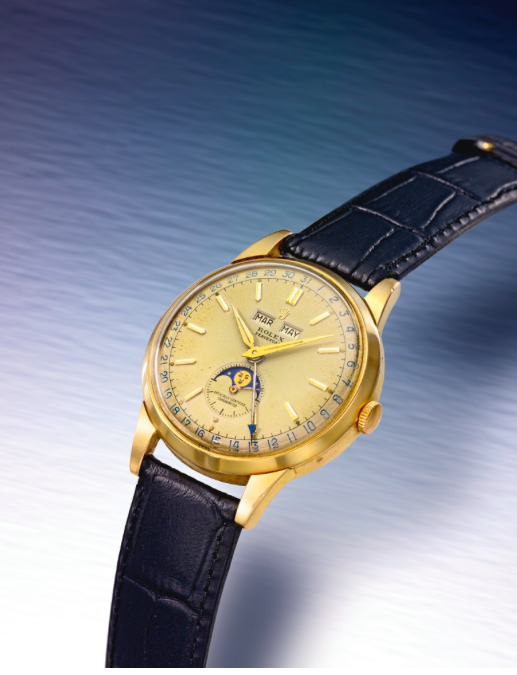 Sold for almost triple the mid-range estimate, this Rolex was manufactured for only three years, from 1949 to 1952. It is one of only two Rolex watches with moon phases, making it a highly desirable collector’s piece. Though we’re surprised this watch sold for almost $100k, buyers are always on the hunt for unique pieces, and this Patek is a perfect example. Made and sold in 1961, the timepiece is one of several designed by Geneva jeweler Gilbert Albert, who worked with the brand throughout the 60s. Inspired by Brancusi and Mondrian, Albert’s pieces are known for their unusual shapes and forms. 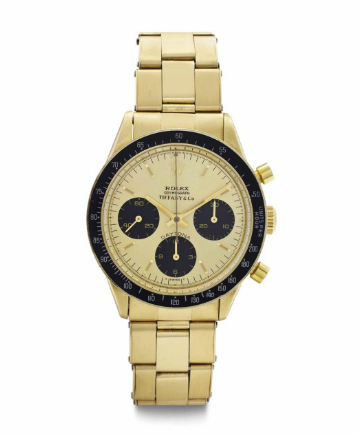 For many collectors, this is a very desired watch to own. One of the most talked-about timepieces in the auction, Patek Philippe’s enamel and pink gold open-faced world time watch sold for over three times its mid range estimate. Made in 1951, the piece features a map of North America, complete with palm tree and ship details. With a similar version living in Patek Philippe’s Museum in Geneva, it’s no surprise that this piece was a top pick for Patek collectors. This year I was fortunate enough to make a personal visit to see these exceptional items. 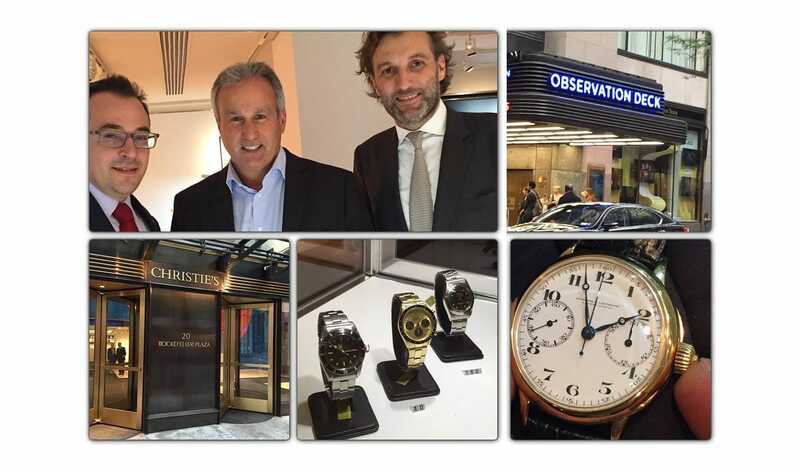 Many thanks to John Reardon and Eric Wind at Christies for the invitation. 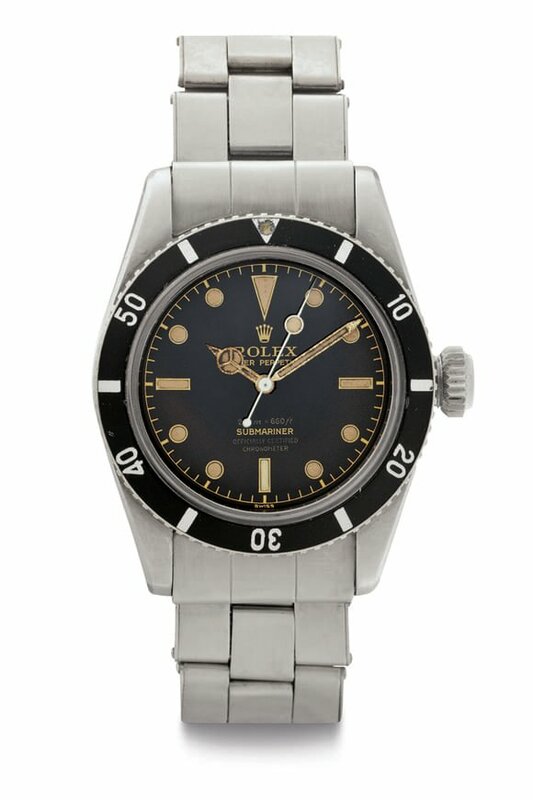 This early vintage Submariner was a very exceptional watch. With an exceptional gilt four-line dial and a case in unpolished condition, this Sub was the one of the highest sellers in the auction—perhaps because it’s the same reference worn by James Bond in Doctor No. Though it sold for well over the estimated price, we think it could have pushed to 20 or 25% more. First introduced in 1970, this Cosmograph Daytona is a collaboration between Rolex and Tiffany & Co., and features a Tiffany signature on the dial, making it an incredibly rare piece and appropriately sold at $143,000. 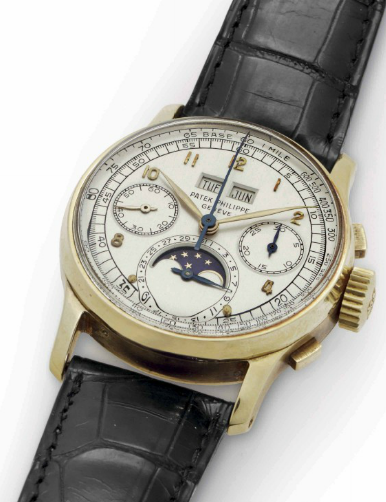 Another timepiece to sell over the $250k mark, Patek Philippe’s Perpetual Calendar Chronograph was made in 1951 and sold in 1953. The first of its kind to be manufactured in series by any firm worldwide, the piece is one of only 281 examples produced. Considering this Vacheron was originally owned by Alexander I, the King of Yugoslavia, it sold for roughly three times the mid-range estimate. Extremely rare and featuring a single button chronograph (which was first introduced in the 1920s), this piece had never before been offered at auction. 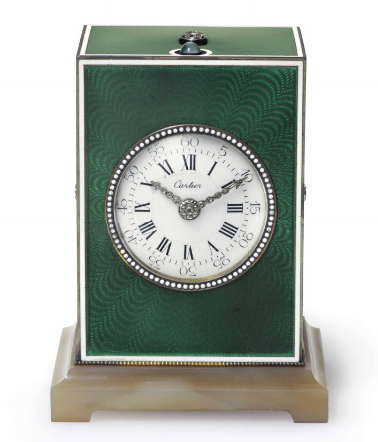 Made with silvered gilt, enamel, agate and diamond, this Cartier carriage clock went for $25k over its estimated price. Dated around 1925, the clock offers a piece of art deco design history. 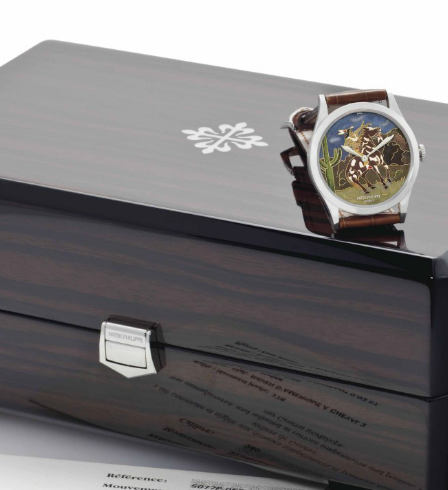 One of the most modern watches in the auction, the Patek Philippe Platinum Automatic Wristwatch was accompanied by a certificate of origin, product literature leather envelope, and presentation box. 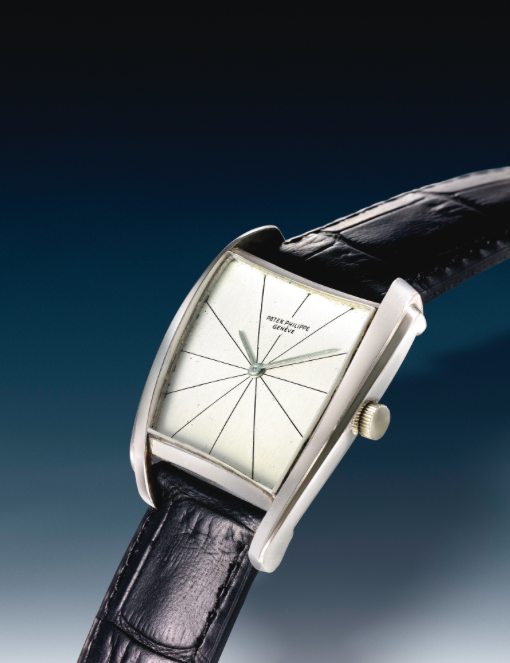 The watch debuted at Baselworld in 2010 as part of Patek’s Native Indians of the Great Plains collection.